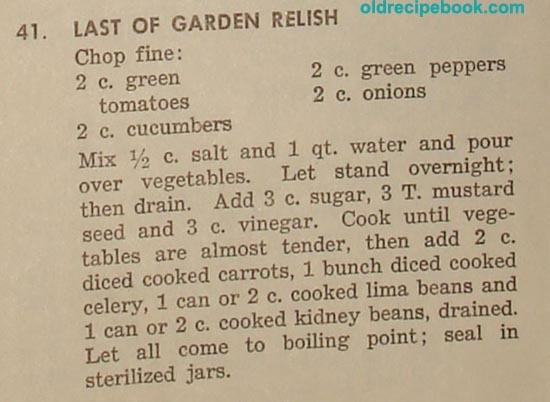 Who doesn't like relishes? 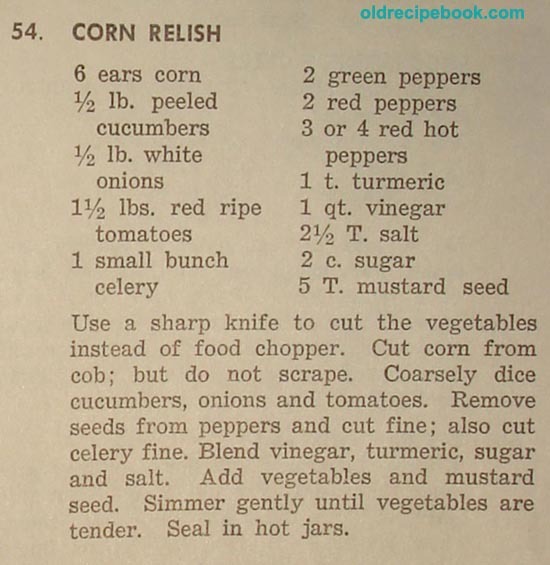 Relish is a great way to use all those vegetables that are leftover at the end of the gardening season. 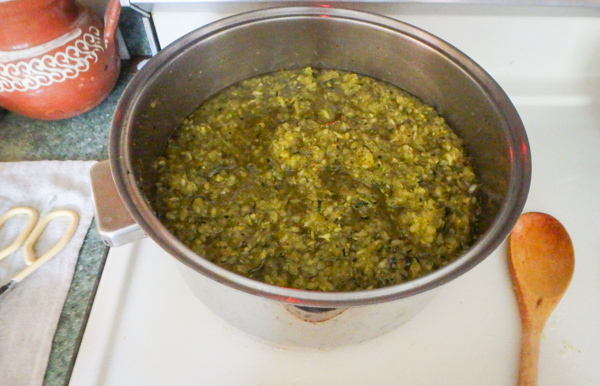 My favorite relish to make is a Green Tomato Relish. 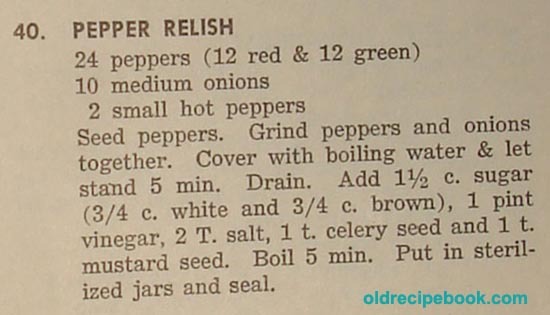 Below is a variety of relish recipes from my old recipe books. Note: Some of the recipes say to seal with paraffin. 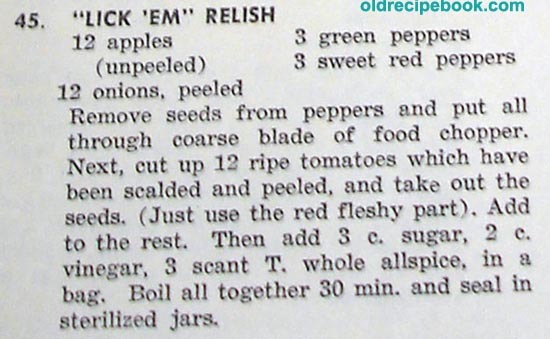 This was a common method of canning relishes, jams, and jellies in the past, and it still works. But, nowadays, we just seal the jars with the canning lids and rings. Fill your jars/glasses to within a 1/4 inch of the top when it calls for paraffin. 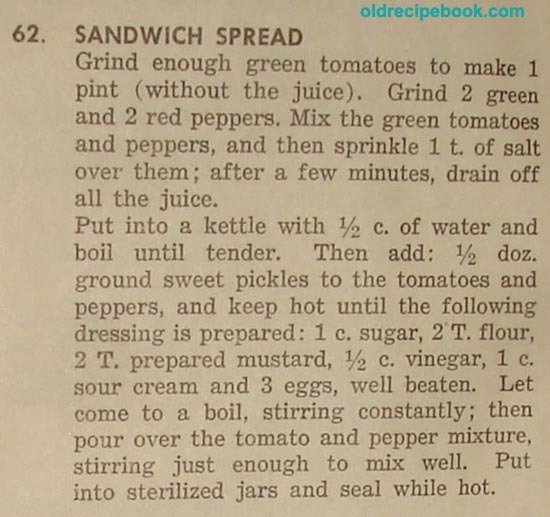 For canning Green Tomato Relish, see the Canning Green Tomatoes page. stand overnight. Next morning, drain. simmer 30 minutes and can hot. 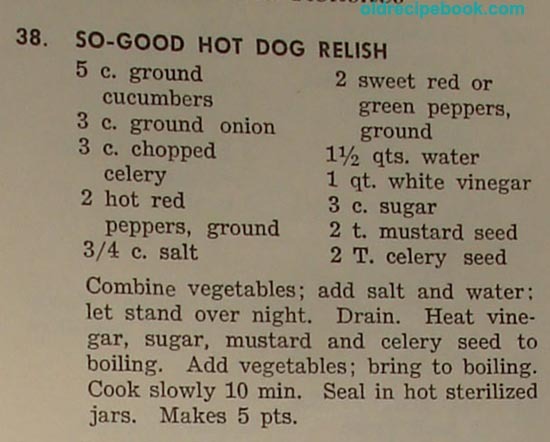 - Don't forget to make some So-Good Hot Dog Relish this year! Mix ingredients in order given. Put in a glass or stone jar and cover. This uncooked mixture must stand a week before using, but may be kept a year. 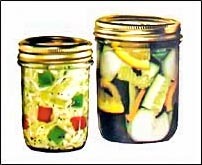 Mix well and seal in glass jars. Let ripen at least a week before using. - Compare it with this Apple Tomato Relish Also here's an Apple Relish recipe. 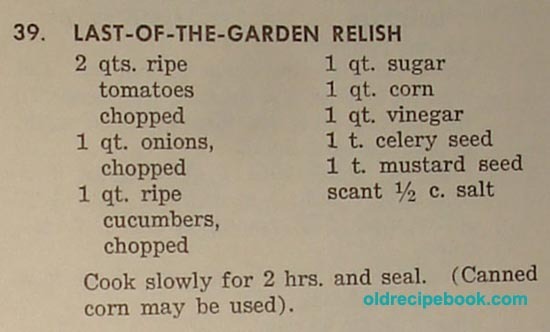 - And check out this Last of the Garden Relish and this Last of the Garden recipe. 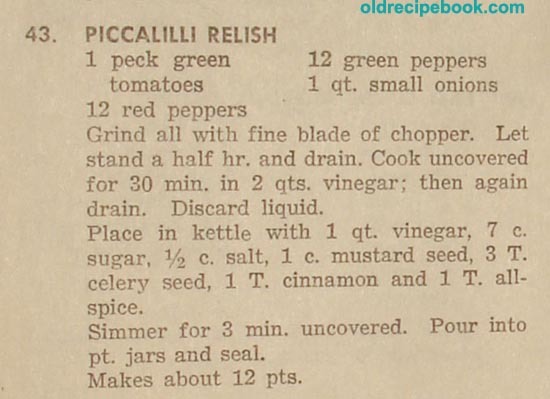 - Here's a recipe for Piccalilli Relish. 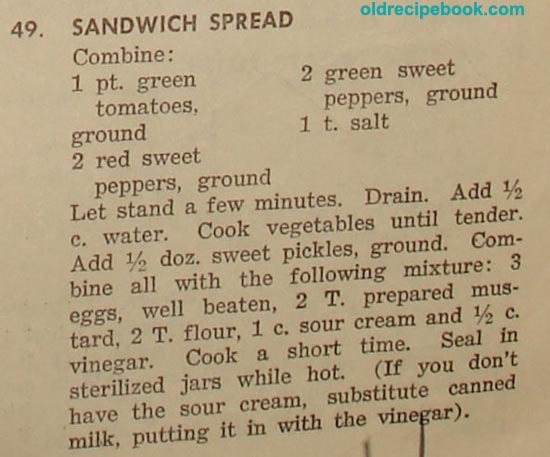 It uses green tomatoes. 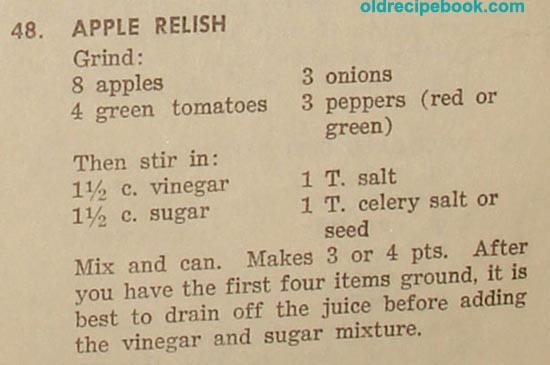 Mix first five ingredients and add vinegar to cover. Pack in jars and seal. Parboil the carrots and then peel them. Put through meat chopper with the lemons. Add sugar and cook until thick. Ten minutes before removing from fire, add chopped almonds. Pour into hot sterilized glasses and when cool cover with melted paraffin. Remove pits from either canned or fresh cherries, mix with other ingredients except nuts, and cook slowly one hour. Add nuts and cook three minutes longer. Pour into hot sterilized glasses and when cool cover with melted paraffin. Cut cranberries in halves, and add all the ingredients except spice, and cook until thick. The raisins and orange are chopped fine. Add spice and cook five minutes. Put in hot sterilized glasses and when cool cover with paraffin. Heat in vinegar and chill. This will keep for several days or you may can. 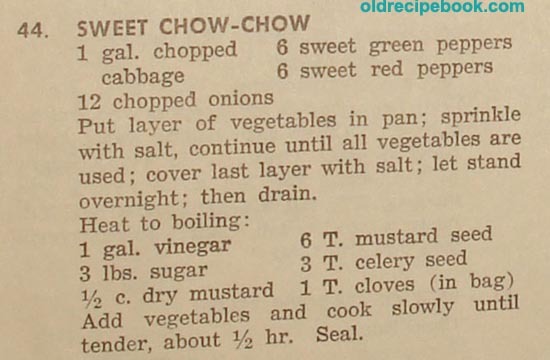 - See this recipe for Sweet Chow Chow that uses cabbage, red and green peppers. Put each vegetable through food chopper using coarse blade. Drain water from vegetables. Measure vegetables after chopping. 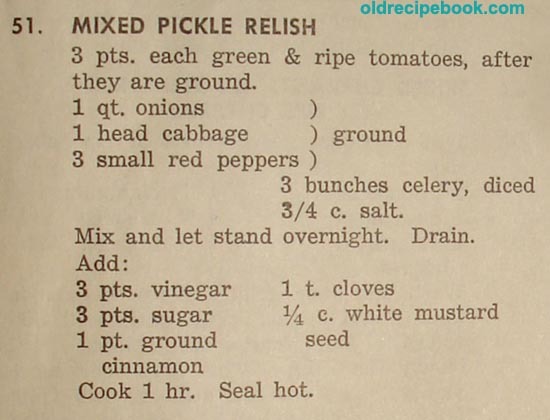 Mix all ingredients and let stand overnight. Next morning pack in jars. 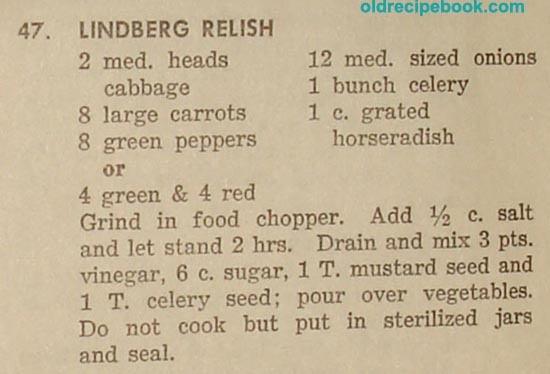 - This Lindberg Relish recipe uses cabbage, carrots, peppers, and onions. Slice onion in very thin slices, drop into boiling soda water and let stand one minute. Drain, rinse with cold water, and shake quite dry. Cut pimiento in small pieces, mix with onion, salad dressing. Serve with meats, fish, or beans. Chop vegetables fine, cover with boiling water, and let stand ten minutes. Drain, cover again with hot water and bring to a boil, let stand ten minutes and drain again. Add rest of ingredients and cook fifteen minutes. Pack hot in jars and cap. Immerse in boiling water deep enough to cover jars and simmer fifteen minutes.